Are you frustrated by slow or stalled weight loss? After making some progress, has your program stopped working for you? Whether you’re looking to overcome a weight loss plateau or avoid one altogether, you’ve come to the right place. In this episode of the BioTrust Radio health and fitness podcast, we reveal 6 common reasons for a weight loss plateau, and more importantly, exactly what YOU need to do to break through it. We’ll also cover the age-old question how often should you weigh yourself? Should you even pay attention to the number on the scale at all? Find out now…Enjoy! 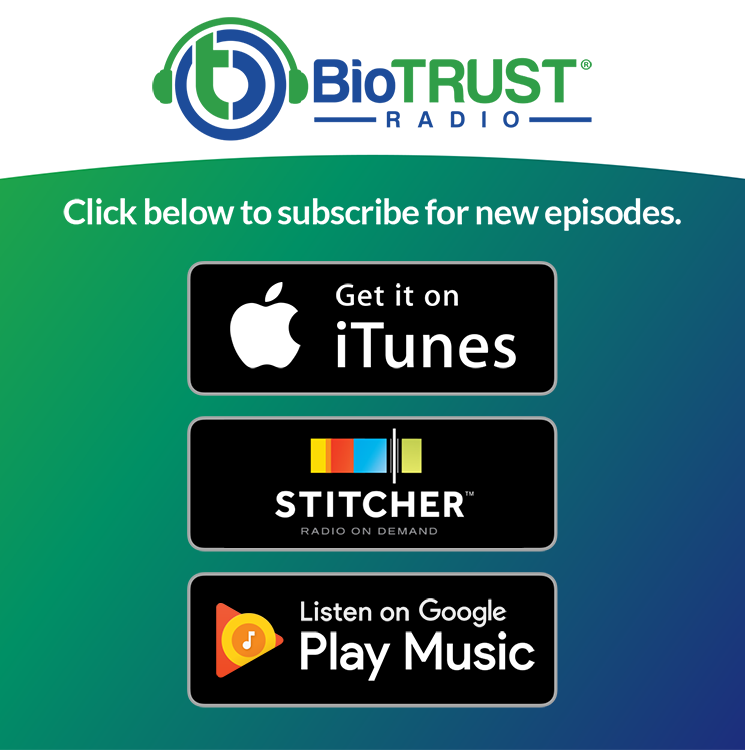 In this information-packed episode of the BioTrust Radio health and fitness podcast, Shawn and Tim answer some common and critical questions: 1. How often should you weigh yourself? (Does the number on the scale even matter? ); and 2. What is a weight loss plateau, and more importantly, what can you do if you’re weight loss progress has slowed or stalled? We don’t control everything that happens to us, but we control how we react to it. ● How often should you weigh yourself? Generally speaking, research shows that frequent self-weighing (daily/weekly) improves weight loss and weight maintenance outcomes. Daily fluctuations in scale weight are very normal. The number on the scale is only data—it does not tell you anything about you as a person. Instead of looking at day-to-day fluctuations, look at averages and trends over time (e.g., week-to-week changes). Even though the scale can be a useful tool, it’s really important to emphasize quality weight loss. Assess your relationship with the scale. Some people may do best with weighing only once per week, and there’s some research showing that weighing on Wednesdays may yield the most reliable results—and people tend to weigh the least on Wednesdays. There are MANY other useful measurements, which you can read more about here: How Do You Figure Your Ideal Bodyweight? How do your clothes fit? How do you feel? ● What is a weight loss plateau and how can you overcome one? Weight loss plateau: After initially having weight loss success, a weight loss plateau typically occurs where progress stalls or stops. As a general rule of thumb, before making any changes to your program, wait at least 2 – 4 weeks of no measureable progress. Metabolic rate is proportional to bodyweight. In other words, as you lose weight, you burn fewer calories, so you have to adjust how much you eat and/or exercise over time if you want to KEEP losing weight. Metabolic adaptation, or adaptive thermogenesis, can contribute to a weight loss plateau. NEAT, or non-exercise activity thermogenesis (spontaneous movement), usually decreases with a reduced-calorie diet. One of the biggest contributing factors to a weight loss plateau: lack of compliance/adherence with your diet and exercise program. When it comes to exercise, many people fail to include progressions. In other words, they do the same thing over and over. ● Another contributor to a weight loss plateau is not adapting, or periodizing, your diet. Instead of a daily caloric deficit, consider “higher” and “lower” calorie days—still creating a “net” deficit, on average, over time. Consider including a cheat day. Can a Cheat Day Help You Avoid a Weight Loss Plateau? Shawn: And we are back on BioTrust Radio. This is Tim Skwiat. Shawn: Well yeah, I mean, this is Tim Skwiat, my partner. And then this is Shawn Wells, myself. Shawn: That sounds weird, I know. But anyway, we’re back here and we’re excited to be here. We’re doing this new format we’re trying, where we answer a question. It can either be from the VIP group, which is on Facebook. “VIP BioTrust,” you look up on Facebook, or our blog, are the two places we’re getting questions from, from our community. And we love to get these questions. We have a good sense that way of where you want our content to go, because we are here for you and we’re trying to provide content that you enjoy. So please tell us, because we’re here for you, and it’s a “you and me” thing. It’s a community thing. So, Tim and I are going to jump in right now with a question and provide the answer, and then we’re going to go into the show topic. And we’re going to try and tie these in so that in that 30 minutes that we not only answer this question, but really dive deeper into some other things that are related. But another thing I wanted to start doing, as we look to just keep improving while we keep moving, is a quote. I thought we might start our shows with an inspirational motivational quote. Shawn: So, “Life is 10% what happens to you, and 90% how you react to it,” Charles R. Swindoll. I think that’s really good. I love that. It’s going to tie into the show a lot in terms of you have the power to change your life, and it’s not everything that happens to you. Sometimes you can get frustrated and say, “Why isn’t my life this way? Why wasn’t I born with this metabolism or this body, or this or that? Why can’t I have tons of money, where I could just have a trainer and a chef at my house?” and all these things. You can’t. Move on. Ninety percent is what you’re going to do about it. Some of these people, the stories we love, the Rockys, the Rudys, the great American story. The people that fight through against all odds. Be that person. You love these stories? Be that person. If you want someone to blame, if you want to start somewhere, stop pointing your finger outwards, start pointing inwards and saying, “What can I do? It’s time to get ready. It’s time to make changes. I’m going to make changes today. It starts with me.” And yes, it can be getting some people out of your life that aren’t good influences. It can be getting foods out of your house that aren’t good influences, etc. Maybe moving that TV out of your bedroom. All kinds of things that are affecting your sleep, your health, your decision-making. So I’ll just throw that out there. Now, back to you. Tim: I just want to say that’s a that’s a great one, Shawn. I’ll just give my two cents real quickly. We talked about mental fortitude before and how important that is, and having a growth mindset and just viewing challenges and obstacles as opportunities. Growth opportunities, as opposed to setbacks and failures. We all fall down. Every one of us. But the most successful people get back up. Tim: Get back up and we look at those things that might be viewed as failures by some people as learning experiences. So, this mental attitude, this mental fortitude is really powerful. And understanding that we don’t control everything that happens to us, but we do control how we respond to it, is really important. So I appreciate you putting that out there because I know a lot of us have this attitude where we feel entitlement or just “woe is me” kind of thing, and we need to get out of that mindset. The obstacle is the way that I succeed, because that adversity makes you stronger. There’s something that’s called homeostasis and then there’s a hormetic-type responses. So, we want to like be at this homeostatic point which just means kind of like this set point, where your body wants to maintain the same temperature, the set amount of food, the set amount of maybe body weight, the set amount of everything. So, that’s how we survive. But then there’s these hormetic responses, like where you’re challenged by a stimuli, and there’s adaptation that takes place because now, with greater difficulty, you reach a new level of homeostasis. Now you have a new normal, because your body says, “Oh, it’s going to be difficult from here on out, so we’re going to make these changes, so it’s not as difficult.” So if you seek those difficulties, if you become that person that like in a stressful situation, you’re the one that thrives, then you’re in a whole different place. Now you’re the person that everyone looks to. You’re that person that makes great decisions under stress. You’re that person that works out harder than everyone else at the gym. So don’t avoid adversity. I’m not saying to be like someone that’s like just destroying yourself looking for terrible ways to hurt yourself, but don’t think of these things as negative things. Look at the positive of them, that you’re getting the chance to grow, as Tim just said, those growth scenarios. This is the way that you become something special. I mean, I feel like I’m blessed that I wasn’t born with tons of money, that I wasn’t given like Brad Pitt looks, that I wasn’t given this genius mind, and all these things because life would be too easy. And if you look at these people, they quite often are destructive, are sad, or are bored because life was too easy. And through that adversity you make something better. So, that’s just turned into like a whole show. Tim: Hopefully you walk away from that inspired and encouraged. That’s what this is all about. We want to be here to motivate you. Shawn: Right, that’s really the root of this show. No matter what the questions are or what the topic is, hopefully you can find that we are motivating you and that we’re here for you. And even if this topic doesn’t deeply resonate with you, then ask us a topic that does. But I think you’ll take something away from all the stuff that we’re doing because of the tone that we’re setting, hopefully. That’s our goal. Tim and I are very positive people and we do care about you deeply. We’re very passionate about what we do and we love this chance to do BioTrust Radio. So this is a great, great, great, great, great, great question. Thank You, Wendy, for asking this and phrasing it this way, because it’s real the way you asked it. And I think a lot of people have felt this. A lot of people have gone through this. This is one of those questions, hopefully, that that many of you get a lot from. So, let’s answer. What do you think, Tim? There’s a lot of pieces that we can attack here, but this is a great question. Tim: Let’s maybe let’s start with the scale weight, like how many times do you guys weigh yourself? What I see here is I see a question about the scale and the scale weight, and then also something that we call a weight loss plateau, where Wendy feels like she’s stuck. So I think maybe we can tease those two things apart. So Wendy’s first question is how many times do you guys weigh yourself? So Wendy’s asking this question in the context of our Facebook group. So it’s our supportive community. That’s who you guys are. So, when I look at the research, what the research shows is that people who weigh themselves more often tend to have better weight loss and weight management outcomes. The reason for that metric probably is it’s a metric and it’s an accountability tool. Shawn: It’s data-driven decision-making and awareness. You’re aware of things. Tim: Exactly. So, that’s what the data says. In my experience, some people can be a little over-concerned about the scale and be like obsessive. Shawn: And it can be multiple times a day, and just thinking like changes are going to be radical somehow in these multiple times a day. Tim: Exactly. And any small change in the wrong direction is just devastating. Shawn: Frustrating. Then it can be transient things like water weight or your clothes. Obviously food or waste in your stomach. Exactly. Or waste in your intestines, or whatever. So, how do we how do we use that data? lt’s not judgmental. It’s just data. Tim: That’s all it is. And so how do we use that data is really what’s important. If someone’s going to weigh themselves daily, what I would recommend is keeping that data in a spreadsheet and then taking a weekly average. Now you can see the trends over time, as opposed to the day-to-day fluctuations. Day-to-day fluctuations are going to look up and down like an echocardiogram or something. Shawn: Well, I tend to think of this as, and this just came into my head as a way to relate this. If BioTrust is a company, right. If I was to just look at our daily revenue, or even revenue at different time points during the day, I mean it might get to be too much. And revenue is only one part of the equation. The other part is your expenses, right? So I think of like muscle and fat. So what’s going on with these two things, and then what’s the net effect, and that’s your body composition. So maybe you should be more focused on your body composition instead of just thinking about one of these data points. It’s difficult to tease out what’s happening here. Like you said, it could be a lot of different things that may make your weight be adjusting. I think what you’re looking for here is one, being healthier; two, having probably less fat mass; and three, having maybe more lean body mass or the right ratio. So that’s like net profit. So it’s like thinking about not just revenue, and not just expenses, but the two together, what do they make? That’s what I would look at, is your body composition. Yeah, it’s good to track weight. That’s an easy one to track. Shawn: I think that’s why everyone looks at it, because it’s the easiest one. If we had some really accurate scale for body fat, maybe we’d use that. But it’s difficult, even the bioimpedance ones that have the current that runs through you. Not that accurate. Maybe the calipers is the most accurate or underwater weighing, but those get to be difficult and you have to have the right person and the right knowledge on how to do it. So it’s all difficult, whereas like getting on a scale is very easy. But I would say, if you’re going to get on a scale, make sure you do it probably at the same time every day, use the same scale every day, make sure it’s calibrated. Those are some good things to do. Probably get a good quality scale that has accuracy, like it’s nice to get maybe a clinical level scale instead of some junky one, if you’re going to think about it, use it a lot. So that’s one thing I would do. But what do you think? Tim: Yeah, I agree with all that, Shawn. Again, to me, it’s an accountability tool and it provides some data. But I love what you talked about with body composition because whenever I’m talking to a coaching client about weight loss, I really want to emphasize quality weight loss. Which like you said, when we lose weight, we want that to be fat. We don’t want to lose that important muscle, calorie-burning lean muscle. Shawn: Or bone or be dehydrated. A lot of people are dehydrated, especially when they’re dieting. So that’s a concern. Tim: Right. I mean, if you want to lose weight fast, just dehydrate yourself. Shawn: Yeah, and that’s a terrible thing. Yeah, you could use laxatives or the water pills, the diuretics, essentially, that some people do, which is horrible for your health. But yes, you’ll lose weight. So what is what kind of weight are you wanting to lose? This is a great question. Tim: So, I think that’s a good discussion of the scale. And again, assessing your relationship with the scale, if you’re the type of person who is devastated by fluctuations. Let’s say you had a cheat day or something and you weighed yourself afterwards. I mean, you’re going to have a hard time looking at that number go up. So, just assessing your relationship with the scale. If you can understand that it’s just data. It’s not an assessment of you as a person, or something like that, then collect it, average it, look at weekly changes, and things like that, just to kind of see where you’re at. But if you have a bit of a negative relationship, maybe limit yourself to weighing maybe one day a week, even. And typically, studies show that Wednesdays, for multiple reasons, tend to be the most reliable. Shawn: Because it’s the middle of the week and you might have more fluctuations in your schedule on the weekends. Tim: Right. Exactly. But like Shawn highlighted, recognize that there are many other outcomes that that we could pay attention to. For instance, just taking a measurement around your bellybutton. That’s easy and very accessible because like you talked about, body composition testing is not readily accessible. At least not reliable methods. So maybe just taking a waist circumference or measuring a couple different body parts that are important to you. Like if you’re a woman, maybe your belly, your arms, and your thighs, and things like that. And if you’re a man, your neck, your chest, and your belly would be good to just have a few metrics to be looking at because a lot of times if you’re not losing weight and you’re losing inches, there’s a good chance that you’re losing some fat and probably maintaining muscle. Shawn: Maintaining muscle. Like there’s some people, if you’re working out, and it is possible to do both by the way. If you’re working out, maybe you are in a situation where you’re stalled on the scale. But Wendy, you said that you’re fitting in clothes better, which is a great sign, and so it’s okay to be “stalling out” because you may be losing fat and gaining muscle, and you’re trading those two tissues. And muscle is about twice the density in terms of weight. So that’s kind of special that that you’re gaining muscle. So I wouldn’t be too upset if your clothes are fitting better. Isn’t that like the best metric? Shawn: You know, when your clothes are fitting better? Tim: She said she feels better, her clothes are fitting better. Shawn: Yeah, you have more energy. Like those are better metrics than a scale. Shawn: So, I wouldn’t get too caught up in the scale. But I will say that there is a flip side, and I will say this. It’s fair to say that the less you weigh, I think the better it is on your joints, at least. Shawn: And that’s no matter what the tissue. So, it is better to be lighter to some degree. But I think day-to-day it’s better to kind of track how you’re feeling, how your life quality is, that you look better, that you’re changing clothing sizes, that things are—like you said—fitting better, you’re having to go buy new clothes. I mean, that’s the thing, right. And when you’re gaining muscle, you’re looking shapelier. But also, with that with that greater strength and greater muscle innervation, like kind of understanding how to use your muscles. Most people, when they go to the gym, are almost like learning how to use their muscles correctly. Shawn: As an example, if I ask you, the listener, to flex your bicep, I bet you can. If I ask you to flex your pecs, I bet most people can’t. I can because I’ve done a lot of chest workouts and I understand what’s happening. I use something called “intention,” and I understand. Tim: Kind of a mind-muscle connection. Shawn: Exactly. Yes, I think about that muscle, I try and contract that muscle while I’m moving that muscle, and I get more out of that movement. But my body is now connecting that, like “Okay, this muscle does something,” and the brain understands what’s going on there, and now I can flex that muscle. I can create that connection, at will. So, that’s a very different thing, when you understand how to use your muscles. So, just some thoughts there. Tim: Yeah, absolutely. Just awareness, mindfulness over all, whether we’re talking about moving muscles or all these things, I think those are key points. Shawn: We’ve talked about mindfulness on this show, like mindful meditation. I love that stuff. Shawn: Just mindfulness is amazing. Being aware of what’s going on. A great example of mindful meditation is you can center yourself by hearing sounds around you. You close your eyes, you listen to the sounds. There might be annoying sounds, like you could be in traffic and there’s some honking and some jackhammer or something. But then you also hear pleasant noises, like maybe there’s classical music in your car. But you take all these noises in. You’re just aware of them, and it recenters you. Shawn: And then you start thinking there’s nothing that’s bad or good, it’s just data, right? It’s just data that you’re taking in, and it just depends on how you perceive it. And so that’s the same thing with this data. It’s helping center you. This data that’s coming in from the scale, from the mirror, from your MyFitnessPal with your caloric intake, and all these things that you’re getting data from, it’s like a way to get you mindful of what’s happening in your life and the direction you’re going. I’m now mindful of these changes that are taking place. And you’re wanting these changes, you’re seeking these changes. So there’s nothing that’s good or bad that’s happening. There’s data that’s happening. And so don’t assign too much to it. Just remember to be centered on why you’re doing it, and then let those things come. Tim: In a very interesting way, that goes back to your quote, like the reaction to that data, right? Tim: And how you respond to it? Tim: The other aspect of Wendy’s question kind of refers to what we call a weight loss plateau. So, she lost 11 pounds and she’s been stuck for the last two weeks. So let’s dig into some things that can help you if you’re struggling with a weight loss plateau. First off, great job Wendy, like we talked about on your 11 pound loss. Shawn: That’s an absolutely great job. Tim: That’s 5% weight loss already, which is a huge step in the right direction. So, Shawn talked about hormetic responses and homeostasis. The body is constantly responding to these changes. So, one of the things with a weight loss plateau, like practically speaking, that we see is that the body’s adjusting to this new normal which you also said, we talked about this new normal. And so, sometimes there’s little quiet periods before things start to happen again. I would say, before making any changes generally speaking, I would wait at least two to four weeks of no progress. Shawn: That’s a great point. Tim: That’s a pretty fair rule of thumb. And then at that point we can start looking at making some changes. And when I would think about making changes, there’s a few things that I would look at. One, I think it’s important to point out that metabolic rate is proportionate to body weight. So basically, the heavier you are, the more calories you burn for any given activity; whether it’s sitting down, whether it’s exercising, no matter what, pretty much. Tim: Or NEAT for short. And this is basically just our spontaneous movement. Could be fidgeting, could be just getting up to go to the bathroom, or could be parking farther away at the grocery store. Just spontaneous movement throughout the day. Well, our body has this drive, this homeostatic drive, to match calories in with calories out, and so one of the things it does is it just tries to conserve energy by reducing NEAT. So, if you’ve hit a weight loss plateau, possibly you’re not moving as much, and so NEAT, by increasing your spontaneous activity is one unique way that you could probably boost your metabolic rate and kind of get back on track from a weight-loss standpoint. Shawn: I’ve seen that. And yeah, if you notice people that have a greater fidget factor tend to be leaner, and there’s definitely a strong correlation there. Because they’re literally just moving around and they’re tapping their foot and rocking back and forth in their seat, and you’re like, “Can you just chill out? Can you just watch the movie? Can you stop tapping your foot?” I know that like sometimes those type of people can drive you crazy, but those type of people tend to be very lean. Shawn: And there’s some physiological reasons that that’s happening. Tim: Yeah, 100%. Another thing, and actually research has shown this, is that over time when people tend to hit a weight loss plateau when they’re compliance to the program, their diet and exercise program, is reduced. What I mean by that is that as you start to get in the habit of you think you have things down, you tend to be a little bit more forgiving. Like you’re not maybe is mindful of how much you’re eating. So instead of tracking things on MyFitnessPal, like you did at the beginning when you’re having a lot of success, you’re like, “I got this,” and all of a sudden you don’t realize it but you’re sneaking in handfuls of nuts here and there, or a little bit of extra portion here and there. Basically you’re overeating now or you’re overshooting what you would need in order to lose weight—hello, weight loss plateau. So it might be a good idea, if you’ve been stuck for a while, to track your calories again and track your food intake, and just see if maybe you’re eating a little bit more than you thought. Shawn: We all slip with time, right? Shawn: Like when you start going to church or something and you’re like all about it at the beginning and you’re on fire, and then like as time goes on you’re like less, and then are you’re just attending, and something like that. Those kind of things can happen. It’s okay, but you have to seek a reset every now and then, like with anything that you want to do as a habit. Sometimes you need to be reset and say, “Okay, why did I start this like?” Or for example, like you start going to the gym, you come in and you’re seeing all these changes because you got this great routine, but then you never change your routine. Shawn: It’s kind of the same idea as the other one I just gave. It was great like for the first few months, but then a year later you’re seeing no changes, and you’re like, “God, I’m hitting the gym every day,” but you’re doing the same thing. You’ve adapted. Now that’s your new homeostasis. Shawn: You need new hormetic responses, so a new stimuli. So you need to mix it up, and that’s that idea of periodization and the gym. You need to do some things to kind of hit that reset button again, and then go back to things being difficult, which is kind of the stoicism thing that we talked about. Shawn: The obstacle is the way. So if you’ve hit a point where there’s no longer that obstacle and it’s easy for you, you need to create a new obstacle. Tim: Yeah, I agree 100%. Exercise is one area where, as a strength coach and personal trainer, you program things so you continue to drive progressions. If you have someone controlling your program, you’re going to tend to have these things in place where you’re having to push yourself a little bit more each time. But if you’re on your own, a lot of times, like you say, you just do the same thing over and over again. And one of the adaptations exercise is becoming more energy efficient at exercise. So what used to maybe cost 300 calories to do is now, an arbitrary number is 250 calories or 200 calories. You’re just not pushing yourself outside of your comfort zone enough to drive adaptation. That can easily play into a weight loss plateau. So, to your point, that’s where changing the program really comes into play. You have to stick with the program long enough in order to allow your body to adapt. So, mixing it up every day or every workout probably isn’t that effective, but maybe after 8 weeks or 12 weeks, when you start to see your progress plateau in the gym maybe you switch things up a little bit. Shawn: What do you think about periodization of your foods, of your macros, of your calories, of like cycling? This idea of periodization that works in the gym, it seems to be lost in in dieting. Some people talk about it and it seems like almost ridiculous or fad-like, but I think there’s some scientific rationale there. What are your thoughts? Tim: That’s a great question, Shawn, because I was thinking about that for a couple reasons. One, if we have that person who’s been following the same diet for a while and then just kind of loosen up the reins, which can easily lead to a weight loss plateau, because this is what I’ve been doing, I’m just kind of getting a little bit of lax in it. Well, starting a new diet or changing things up just a little bit like that maybe gets you more engaged and more mindful of what you’re doing. So maybe compliance increases, and so now you’re hitting your macros or your calorie targets better than before just because of that small change—and you break through that weight loss plateau. Physiologically, there may be some application to that as well. Certainly with athletes, periodizing nutrition applies to their training. You definitely want to match nutritional intake and needs with the training. But maybe eating, let’s say your carbs around workout time, maybe that facilitates more intense exercise for you, or you burn more calories. Now you’ve got this metabolic rate, and boost it a little bit more. So I think there’s some application to it from that standpoint. Again, that can easily help you overcome or avoid a weight loss plateau. Shawn: Well, what about the idea of like instead of just tapering your calories, like constantly downwards, like having a feeding day where you go higher in calories, so that like your metabolism may not completely adjust, or whatever. Like one or two days a week where you kind of angle up and then you angle back down. Shawn: That’s kind of periodization of calories, so that you don’t just get used to just slowing, slowing, slowing, slowing. Thoughts? Tim: Yeah, I like that idea, too. There’s a couple things that I think about there. On one hand you have like the cheat day kind of philosophy, where that increases metabolic rate, and certainly you’re going to have this thermic effect of feeding relative to the amount of calories you take in, so there’s that. But one of the things that I think’s relevant and important to bring up when you say something like that is that you don’t have to have a caloric deficit every single day. Shawn: Right. It’s a net effect. Tim: It’s an average. Right. Exactly. And so an alternate day fasting, where maybe you have a complete fast or 500 calories only on one day, and then you can eat as much as you want the next day. Maybe you only eat a total of 3,500 calories over the course of two days, but if you need 2,000 calories a day, you’re still netting a 500 calorie deficit over the course of those two days. So, I think that’s where that can have a beneficial effect. I think it increases compliance, which can certainly contribute to a weight loss plateau as we’ve alredy talked about. The alternate day fasting is a bit of an extreme, but it’s all just the net effect, I think, from that standpoint. And I do think that if you’re constantly below baseline, it can bring you down a little bit. So having some of those higher days, I think, can improve quality of life. Shawn: Something you can look forward to. Yeah, exactly. That’s good. Well, I think we crushed it, yet again. Hopefully you all loved this episode. Again, you can tell us what to do on our show. You can direct our show content, and we look forward to that. You can ask us questions and we’ll answer them on air, and again, go to the BioTrust VIP group on Facebook or our blog at BioTrust.com. Hopefully you enjoyed this and thanks again everyone. A special thanks to Wendy. Tim: Yeah and just one final note. I did want to mention—this is this added bonus—that after Wendy’s question came in, the next week she reported that the scale had gone down another pound. Shawn: Boom! There you go. Great job, Wendy. Thanks. Self-weighing in weight management interventions: A systematic review of literature. Patterns of self-weighing behavior and weight change in a weight loss trial. Are Breaks in Daily Self-Weighing Associated with Weight Gain?